William David Upshaw was born on October 15, 1866, near Atlanta, Georgia and died on November 21, 1952. He served in Congress during the late 1910's and throughout the 1920's, and ran for the office of the President for the Prohibition Party in 1932. Followers of the message have been repeatedly told how, at the age of 84, 66 years after becoming physically handicapped, William Branham said that he saw a vision of Congressman Upshaw walking. 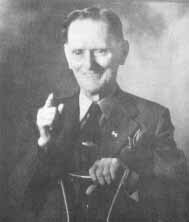 Branham prayed for Upshaw, who was instantly healed, and had full use of his legs for the remainder of his life. Read the facts for yourself as outlined below. But in the newspapers, we find Upshaw travelling around in convoys of automobiles, walking around freely using his crutches, and speaking to multiple audiences per day -- both for policical speeches and evangelistic sermons. So it appears that Congressman Upshaw's healing may not have been quite as miraculous as it was described by William Branham. Additionaly, there is a significant concern with the huge changes in the story over time as it was told by William Branham. William Branham's testimony (1951) is initially in basic agreement with that of the Congressman. However, by 1954 it had changed to to the point that there is a vision of a brown suit and a wired microphone is run back to the Congressman to allow him to have a conversation with William Branham from the pulpit. Leroy Kopp's part in the miracle is completely eliminated as William Branham himself told the Congressman over the pulpit - "THUS SAITH THE LORD, you're healed." Why did a real miracle from God require embellishment? Shortly before his death on November 21, 1952 at age 86, William Upshaw published his testimony in a tract which he sent to every Senator and member of the House of Representatives, as well as President Truman, Winston Churchill, King George, and Joseph Stalin. I walked into that Branham-Baxter meeting in Calvary Temple, Los Angeles, loving God and His blessed Word, leaning on my crutches that had been my “buddies”-my helpful comrades for 59 of my 66 years as a cripple-7 of those years spend on bed; I walked out that night of February 8th, leaving my crutches on the platform – the song of deliverance ringing in my heart in happy consonance with the shouts of victory from those who thronged about me – their tears of rejoicing crystal with the light of the skies’ chief among them was my blessed wife whose dear face, glowing amid her joyous exclamations: “Praise the Lord” and “Glory to God,” was beaming like a patch of Heaven. …Then came God’s humble Bible Prophet, William Branham – and that “Boanerges Son of Thunger” (who can out-“Hollywood” Hollywood, and never get away from Calvary) Ern Baxter – making one of the greatest evangelistic Bible teams that has ever blessed the world since Paul and Barnabas laid the pillars of God’s Kingdom on the shores of Tiberius and the Mediterranean. We had looked forward to hearing “Billy” Branham – knowing that his ministry to be mightily blessed of the Lord-; but we were not prepared for Baxter – that indescribable combustion of wit and wisdom, and enriching Bible interpretation, who is an imperative John the Baptist, preparing the way for Branham. I sat entranced, still praying for “appropriating faith,” but holden, somehow, of that contact – and that contract with the Lord sixty odd years ago. Others were being healed all around me. Then Brother Branham lifted his hands saying: “Everyone lay your hands on your loved one as we pray.” A great volume of prayer ascended throughout the audience of more than three thousand. Angels were hovering near! I knew my blessed wife and her “prayer warriors” were wrapping me in prayer. I remembered how she said, “When you are trying to lead a sinner to accept Christ you say; “Accept – confess Christ and step out – He will do the rest and bring the joy of answered prayer’.” It was the touchstone. Just hen Brother Branham, exhausted, was carried from the platform. Brother LeRoy Kopp, Calvary Temple’s golden-hearted pastor, came back to the pulpit and said: “Brother Branham says ‘The Congressman is healed’.” My heart leaped. I stepped out and accepted the Lord as my Healer. I laid aside my crutches and started toward the startled Pastor and my happy, shouting wife – and the bottom of Heaven fell out! Click here to view a copy of the tract written by Congressman William D. Upshaw. William Upshaw was “healed” on Feb. 8, 1951 and died less than two years later on November 21, 1952. Remember, I'm sending this folder to every congressman, and senator, the president, and his wife, and now sending this week to the King of England for whom he prayed, and Winston Churchill. And I'm going to send one to Joseph Stalin. God have mercy on his soul! William Branham retold the story of Congressman Upshaw's healing many times. However, over time the story changed considerably so that by 1954 it included a vision of a brown suit, and a "Thus Saith The Lord" statement spoken by Brother Branham to William Upshaw directly over the pulpit, and not as communicated by Brother LeRoy Kopp. Initially the story that William Branham tells is very close to the testimony of Congressman Upshaw. And as I started, Mr. Kopp here, the... Brother Kopp, the pastor run up there. And I said, "Go tell the congressman that God has healed him. I seen him, going walking away." But three years later, it had already changed considerably. And I looked. And coming in, they just got off of an airplane. And here come a wheelchair. They'd just got inside the building and it begin come... It was moving on down to get it with the rest of wheelchairs. I said, "That's the old gentleman now." It was about twice the distance of this building. I said, "That's the old man now." And he was weeping so, I went ahead and told my brother to call the prayer line. And so we begin to get them lined up, and so the next thing taking place, why, they had an extension mike here, and Mr. Baxter said, "Brother Branham," said--said, "That old man that you were speaking to is the Congressman of the United States. It's William D. Upshaw." I said, "I don't know who he was." He said, "He wants to speak to you through this mike." And he said, "My son, how did you know that I fell and hurt myself when I was a boy?" I said, "I can't tell you, sir. I've never heard of you in my life. I'm sorry." "And he said, "Well, I was the president of the Southern Baptist Convention." said, "Dr. Davis, the one that ordained you in the Baptist church, was the one who sent me here to see you." "I said, "I am acquainted with Dr. Davis." "He said, "I been prayed for." said, "I've been a invalid in this wheelchair for sixty-six years." And he said, "I'm eighty-six years old now." And he said, "I have trusted God, since I was seventeen years old when I was hurt to heal me." Said, "Do you think I will ever be healed?" "I said, "I could not tell you, sir." I said, "I can only say what I See?" "He said, "God bless you, my boy." "And I said, "Thank you, kind sir." And I turned this a way and when I did, my brother, being the chief usher in the meetings, was getting the people lined up down there. And as I looked, I seen that old congressman, like a shadow, going walking like that. And he was setting there with a blue suit on and a red tie. Only in the vision he had a brown suit, a kind of a chocolate colored brown, with a white stripe in it. And I said, "Congressman, have you got a brown suit with a white stripe?" He said, "My son, I just bought one yesterday." I said, "You have been a very reverent man and it--has honored God all these years. And through the honoring of God and believing God, God has... rewarding you now, to give your last days happy. You can walk Congressman. The Lord Jesus Christ has healed you, THUS SAITH THE LORD." He said, "When will I be able to walk, my boy?" And I said, "Right now, Congressman." And up he jumped from that chair, threw aside... He had big crutches that went up over his shoulders, when they'd stand him up; it was like Mister Roosevelt, I... like that, in his back. I said, "Congressman," (they run the address system to him quickly). And I said, "Haven't you got a brown pin striped suit?" He said, "My son, I just bought one yesterday." I said, "In Jesus' Name, come here." And that man, being bound to his... When they raised him up like President Roosevelt, with those great, big things over him (braces) and he walked. You know how he walked, if you knew him. And he threw those down, raised from his wheelchair, run to the platform and touched his toes like that, and stand up as a real man. And it's...?... the nation. At the age of 18, William Upshaw lost the use of his legs as the result of a farming accident, and spent the next seven years in bed. Shortly before his accident, he had given his heart to the Lord Jesus. From his bed, William began to write a column of poems and inspirational letters for a local newspaper called Sunny South, using the pen name `Earnest Willie.' His calm manner and gifted style of writing soon endeared him to the hearts of his readers. He was encouraged to publish his writings in a book, which he did, titling it "Earnest Willie, or, Echoes From A Recluse." "I do believe in being deeply in earnest. It is the very passion of my soul. Earnestness is the secret of nearly every man's success, and it is the lever that persistently pushes to completion nearly every movement for reform, whether it be great or small. Let a minister of Christ or any other speaker convince me first - aye, all the people who hear him - that he is in earnest - that his very heart and soul are in his work, and then he may break the rules of grammar if he wants to, just so he breaks and blesses human hearts." Using the funds from his writing, William Upshaw entered Mercer University in 1895. In 1918, he was elected to the U. S. House of Representatives as a Democrat. He was re-elected in 1920, 1922, and 1924. William Upshaw ran for President of the United States for the Prohibition party in 1932, but returned to lecturing after his defeat.